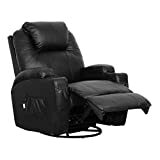 In this article, we are going to talk about foldable massage chairs (for massager or professional) and electric massage chairs (for home or office). Just in case, you think of having a good massage after a long working hour but at the same time you are too lazy to turn yourself to the professional. Without further ado, let’s meet our number 10 on the list. Giantex, one of the most famous furniture brands has made its way to the massage chair market. 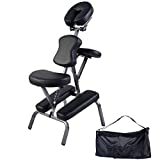 This massage chair is designed to fit in any position you want by having the adaptable seat, armrest, and head support. To make it more durable, powder-coating aluminum has been used as a frame along with PU leather that has water and oil resistant. With its portability and foldable flat design, you can enjoy your body massage wherever you want. Looking for a portable massage chair? Don’t worry we have got one for you! 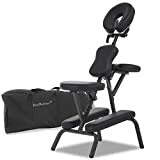 Using T6 aluminum alloy as the chair frame along with high gloss powder-coated, this massage machine will give you a stronger yet lighter massage with just 19lbs. The seat adjustment on this chair makes it more comfortable for the user as it can tilt from 4’ 6” to 6’ 6” easily. Moreover, you can adjust the height for leg, foot or anterior torso work and the armrest as well. If the users were injured or disabled people, you could remove the leg pads to suit their condition. With the attached wheels, foldable feature, and nylon case, you know you can count on this massage chair at any place and any time! And a lifetime limited warranty for you. The list just keeps getting better and better! This one is made of top grade aircraft aluminum that ensures the lightweight of the product with just 16lbs, and at the same time gives you the sturdiest frame you could never ask for. Everything on it from top to the bottom is adjustable, so the users will not have any problem with their positioning during the massage. Nothing much to talk about this product, but Earthlite surely knows how to take care of your body. Crazy offer: Lifetime warranty on the frame, and 3-years warranty on the cushions and upholstery. Never judge the book by its cover! 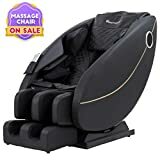 This might probably be the simplest massage chair to you but don’t get this wrong, this thing has the weight capacity of 700 LB static and 300 LB working. Coming in black color, the overall dimensions of this product is 29″ L x 48″ H x 18″ W. 100%. Ultra soft PU surface has been used as a foam and also the adjustable seat, armrest, and face cradle to maximize the greatest comfort to your body. With this unbeatable price on a great quality product, this is a great deal for you. Let’s get your body massage done right with Shiatsu! 60% radius increased will make sure that you can feel the ultimate relaxation from head to toe. Coming with various massage methods, you can choose from “relax, extend, recover, or refresh” to fulfill your desire. Moreover, this chair is also equipped with OPTO sensor device, which gives you a special shoulder massage based on different shoulder position. Roller scraping will deliver a great massage to your foot that can improve your blood circulation, immunity, and fresh feeling not to mention heater on your waist that will deal with backache, and stomach cold. Sit back and let Esright does the job! Not a portable massage chair you can expect, but this one is designed for something greater. There are 3 main features to treat your body well “reclining, heating, massaging and vibrating” accompanied by 360 degrees and 150 degrees recline feature for your desired positon. With 2 cup holders, and 4 storage bags on the sides, you can enjoy your favorite drink while having a great massage. The whole chair is filled with durable PU leather, and extra thick sponge on both armrest and the backrest for extra comfort. It also comes with remote control that has 5 different modes, and 2 intensity levels on top of the above-mentioned main features. Another Shiatsu product to be considered! The programmer has included 4 humanized massage function such as kneading, spinal rolling, shiatsu, and vibrating with special time controller on it. So, you can set the duration for 5minute or the maximum 30-minute uninterrupted massage. There is also an automatic mode that allows you to get mixed up massaging methods. Besides giving you the massage, it also has a heat therapy at the backrest to deal with sore muscles on your back. 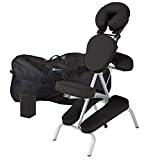 Therapeutic airbags, 6 simulating kneading balls, and 3 true zero gravity can all be found on this chair, and with these materials and technologies, you know what kind of massage chair you will have from Shiatsu. Shiatsu product just keeps coming for more! A little upgrade on this product for a better flexibility, the producer has attached compression and percussion into this chair. The power rollers are best to use against sore muscle, fatigue, and stressful mind. 30 air bags built in with heat intelligent roller system at the backrest for flexible massage from shoulder to your hips. Last but not least, the neck massage feature will detect the “tsubo points” on your neck and soften the pain on your upper body especially the head. 1-year warranty from the Shiatsu brand for purchasing this amazing massage chair. With this #1 best selling product on our list, you know we are serious about products selection. 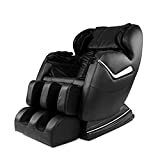 4 different massage methods can be found on this incredible massage chair as well as pulse-type airbag extrusion massage and foot roller scratching for real massage experience. There is an added zero-gravity surround space capsule into the seat along with 8 massage points at the back of the seat for greater effect. You can also feel the greater support on your whole body from 50 air bags as well. Another standout point of this chair is the waist heater which will eventually improve your metabolism and blood circulation. 3-years warranty from the company for any problem that will occur. We finally get to see who is the number 1 spot on this list. This has to be the best massage chair you have ever seen so far. First off, L-track system will initially run through your whole body first before giving you the right massage based on your boning structure. The Air massage technology has been programmed with 6 different auto programs like dual foot rollers, and special yoga stretching programs to work on every part of your body. It also adds heating therapy to improve your blood circulation as well. Three level zero gravity, double layer shoulder airbags along with extra foot padding, you can already feel how comfortable it is by just knowing the materials they have used on this massage chair. 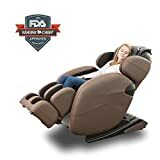 This is a highly recommended massage chair in 2019 with enormous positive reviews from the users. And, Great offer from Kahuna brand with 3-year warranty. 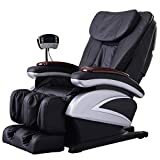 After going through our list on 10 top Best massage chairs in 2019, you have come to the easiest part as u get to choose your favorite one. All of these high quality products are obtainable online, what are you waiting for? There are also youtube video available about each products. You have also can search from there about its functionality.